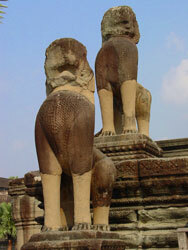 Sunrise; Afternoon for best light on face; Fewer visitors in the morning. 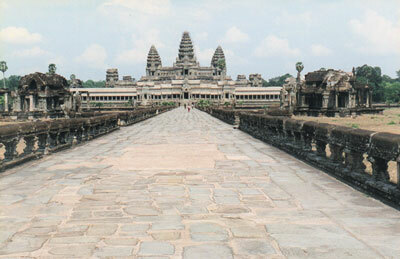 Angkor Wat is surrounded by a moat and an exterior wall measuring 1300 meters x 1500 meters. 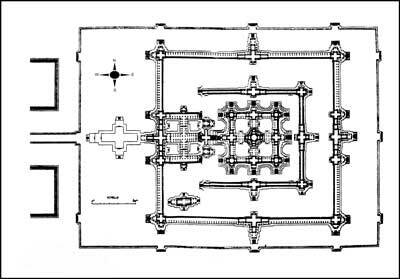 The temple itself is 1 km square and consists of three levels surmounted by a central tower. 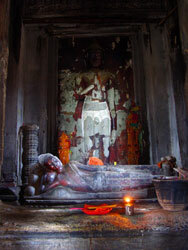 The walls of the temple are covered inside and out with bas-reliefs and carvings. 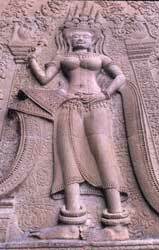 Nearly 2000 distinctively rendered apsara carvings adorn the walls throughout the temple and represent some of the finest examples of apsara carvings in Angkorian-era art. 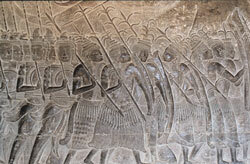 But it is the exterior walls of the lower level that display the most extraordinary bas-reliefs, depicting stories and characters from Hindu mythology and the historical wars of Suryavarman II. 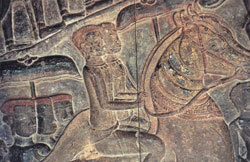 It is in the viewing of the bas-reliefs that a tour guide can be very helpful. 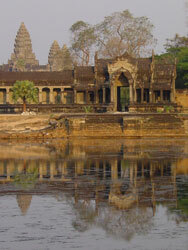 The northern reflecting pool in front of Angkor Wat is the most popular (and crowded) sunrise location. 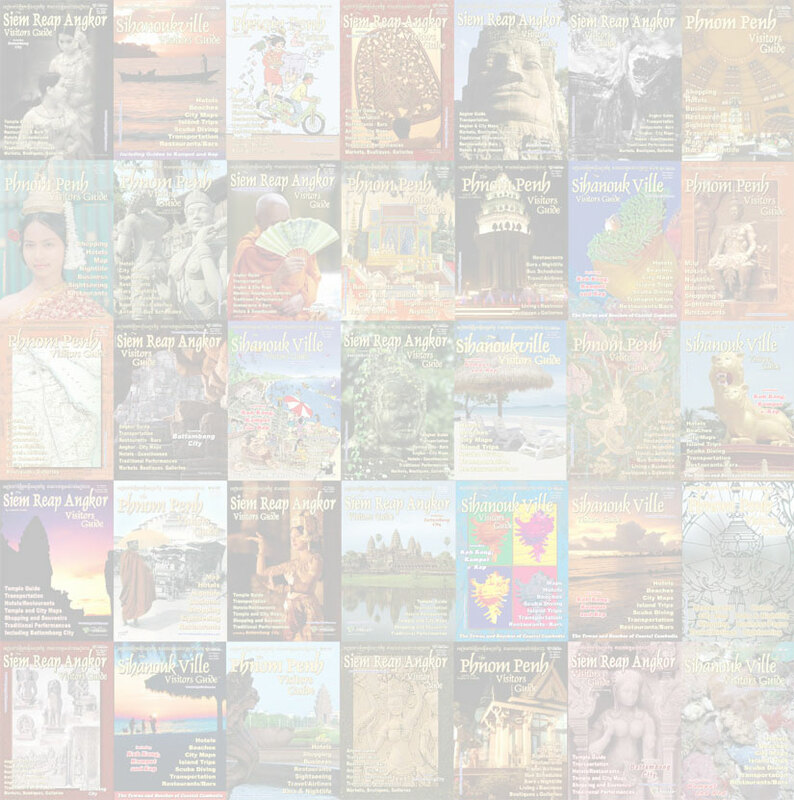 The sun rises behind Angkor Wat providing a silhouette of the temple’s distinctively shaped towers against a colored sky. Some of the best colors appear just before the sun breaks over the horizon. 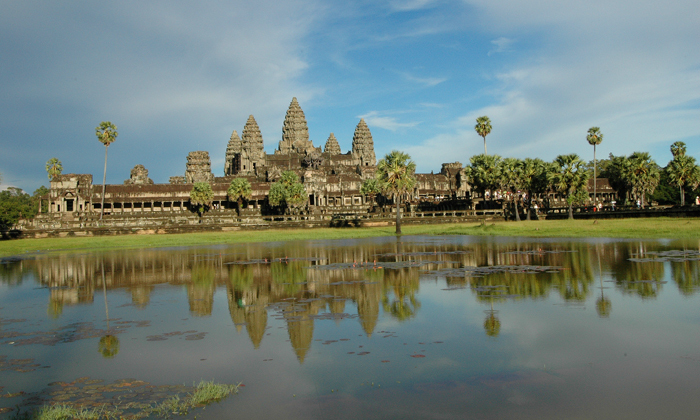 The visual impact of Angkor Wat, particularly on one's first visit, is awesome. 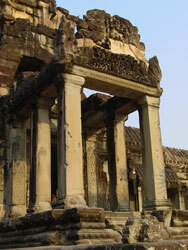 As you pass through the outer gate and get your first glimpse, its size and architecture make it appear two dimensional, like a giant postcard photo against the sky. 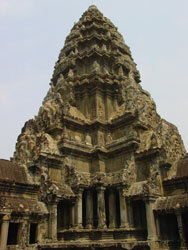 After you cross through the gate and approach the temple along the walkway it slowly gains depth and complexity. To maximize this effect you should make your first visit in optimal lighting conditions, after 2:00PM when the sun is on the face of the temple. 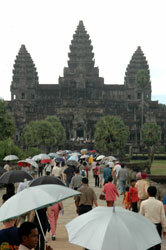 Do not make your first visit to Angkor Wat in the morning when the backlighting obscures the view.